Dushan (Hindi: दूषण) was a man-eating rakshasa in the Indian Ramayana epic. 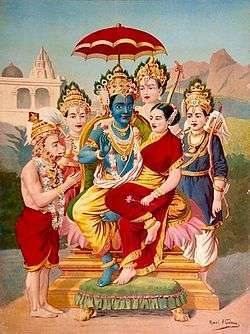 According to Indian epic Ramayana, Dushan and his twin brother Khara, younger brothers of Ravana, were demons who ruled the Danda Kingdom. After Lakshmana humiliated Shurpanakha by cutting off her nose, breasts and ears, Khara and Dushan went to war against Lakshmana and Rama. During this fight, Dushan was killed by Rama.